Why buy a personal jet when you can own just its availability depending on how much you actually use it? This is the question posed by clients of NetJets, a company with offices in USA, Europe and the Middle East, dealing precisely in this line of business, in other words selling their fleet of aeroplanes divided up into shares. This means that anyone wanting to buy a plane yet not needing it 365 days a year can simply buy a quota. The shares comprise packages equivalent to flying hours. In the United States for example, a 1/16 share corresponds to 50 flying hours a year meaning that one quota gives the purchaser the right to use the jet for those 50 hours per year. This leads to considerable savings, as the client spends in proportion to use made of the plane and only for his quota, without having to pay extra charges when the plane is on the ground at the airport. The NetJets fleet is divided up into three categories in order to satisfy all possible requirements. The principle behind the NetJets system does not however mean that those buying a share in the aeroplane have to take a bit of it home. In practice, all the client has to do to avail of his share is to contact the company and the plane will be ready a few hours later. Once the client has reached destination, all he has to do to get the plane back again is call NetJets back and they will send him the same one or an equivalent or even an upgraded version. Another advantage offered by this formula is that of being able to travel practically anywhere, without limits. Interaction between NetJets US, Europe and Middle East in fact permits those needing to fly to do so almost all over the globe with the advantages offered by the company's conditions. For further information: NetJets US; 581 Main Street; Woodbridge, NJ 07095; c/o Marketing Department; tel. 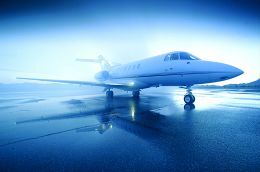 (732) 326-3700; fax (732) 326-3737; website www.netjets.com; e mail ussales@netjets.com - NetJets Europe; 60 Sloane Avenue; London SW3 3DD; tel. 44 (0)207 590 5120; fax 44 (0)207 590 5111; e mail netjetsinfo@netjets.com - NetJets Middle East; Saudi Business Center; 14th Floor; Medinah Road; P.O. Box 18118; Jeddah, 21415; Kingdom of Saudi Arabia; tel. 966-2-652-0001; fax 966-2-652-0394; e mail sales@nasaviation.com.